For today's Makeover Monday I will be going over the first concept design for Erik's Office. This is Erik's room so I have given him full creative control but I wanted to show you what he has shared with me. This concept design covers the wall to the left as you enter the room and the wall to it's right. 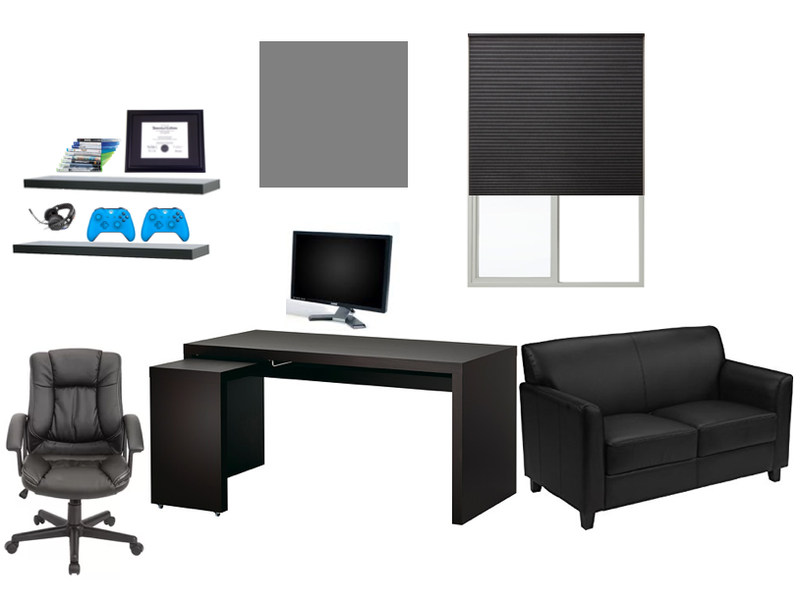 As I mentioned in my previous post, Erik and I settled on a gray office with black furniture. The walls in Erik's office have already been painted a dark gray. Erik specifically chose this black desk because of the pull out panel. It fits under the desk when not in use and is the perfect temporary desk for when a friend brings their computer over. Since the desk doesn't offer a lot of storage I suggested adding two shelves slightly above the desk to create room. This gives storage for his computer games, headphones, controllers and at my request his degree. I will make him show that (soon to be two) off. On his desk he has his desktop, keyboard and mouse. Behind the desk his black leather desk chair. Directly in front of the desk Erik wants to place a black leather love seat. Both the love seat and his desk will face the TV. The love seat will be the seating area for when they are playing his game systems on the TV. Above the front of the desk and the love seat is the window. We chose a gray black out shade for coverage. The shade fits the modern feel of the room and will create a dark atmosphere even during the day. What do you think of the first design? Any suggestions for his office?